Czech Republic – every day's a holiday! a. Frederick Scantron, inventor of the multiple-choice test. b. Dixon Ticonderoga, explorer and discoverer of the graphite mountain from which all pencils are hewn. c. Jan Amos Komensky, teacher, pastor and writer who was expelled from his own country to spend 42 years in exile. Today is the birthday of Jan Amos Komensky, better known by his Latin name Comenius. M: Come, Boy, learn to be wise. P: What doth this mean, to be wise? M: To understand rightly, to do rightly, and to speak out rightly all that are necessary. 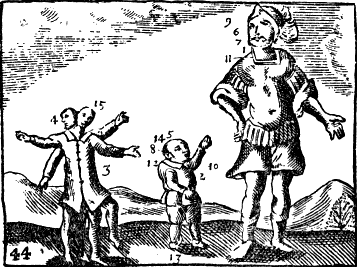 So begins Comenius’s Orbis Pictus, a “Nomenclature and Pictures of all the Chief Things that are in the World and of Men’s Employments therein.” The first illustrated encyclopedia for children. — History and Progress of Education, by Philobiblius, N.Y., 1860, p. 210. Referring to the schools of his youth as “slaughter-houses” of the young, it wasn’t until he entered Herborn University at age 19 that things turned around. He studied at Heidelberg, traveled to Amsterdam and Hungary, taught at his old Latinschool in Moravia, and became a teacher-pastor in 1618, at the outbreak of the Thirty Years War. Things did not go well for Komensky during the war. 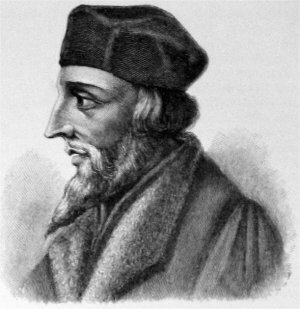 As a member of the Brethren of the Unity, a Protestant group based on the the theology of Jan Hus, Komensky and his circle were persecuted. Spanish soldiers burned his village and most of his possessions, including his library and his own writings. His wife and two children died during an epidemic. And he was forced into exile. Komensky’s exile would last the rest of the his life. Bad for Komensky, but good for Western education. Emphasizing self-discipline as motivation for learning rather than physical punishment, he disseminated his progressive vision across the many lands he traveled while in exile, including Poland, England, Hungary, the Holy Roman Empire, the Netherlands, Sweden, and Lithuania. He never made it to the Americas, turning down an opportunity to head up a new university called Harvard, in favor of an offer by the Swedish Ambassador. And in the 1650’s he supported the Sweden’s takeover of Poland, a move that led once again to the burning and destruction of all his property, this time by angry Poles. Decades of his writings went up in smoke. Still, his Janua, Orbis Pictus, and The Great Didactic were among many works that survived to form the basis of elementary education in Europe. He is credited with redefining the curriculum and learning environment used in Western education for hundreds of years. The Comenius Medal for education, established in 1992, is one of UNESCO’s most prestigious awards. 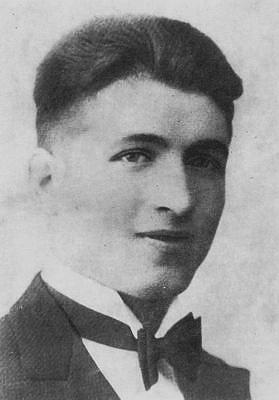 And though he was never able to return to his homeland, the people of the Czech Republic and Slovakia honor Komensky on his birthday by celebrating the noblest of professions: Teacher’s Day. About this time of year parents deliberately wait in long lines in overcrowded shopping malls so their kids can sit on the lap of a fat red stranger. Some cultures might call this odd. We call it Christmas. 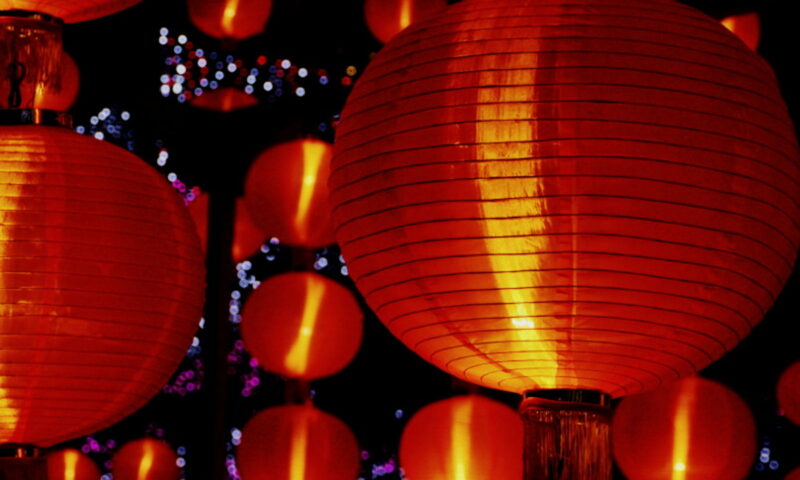 Though the Christmas season begins commercially on Black Friday, and religiously on Advent, tonight kicks off the season for children in Europe, including the Netherlands, Germany, Belgium, the Czech Republic, and Austria. It’s St. Nicholas’ Eve, and though the date and the figure go by many names, the themes remain the same: kids and candy. The jolly bearded guy known as Santa Claus in the United States is actually is an amalgamation of numerous folk figures. 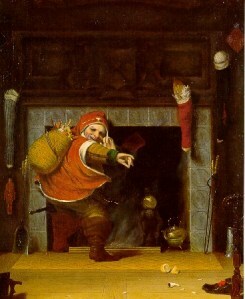 The United States imported “Santa Claus” mainly from the Dutch Sinterklaas. Long before that, the Dutch learned of the saint, Saint Nicholas, from Spanish sailors, who believed Saint Nicholas had the power to save sailors by stemming storms at sea. Even today Sinterklaas arrives in Holland on or around November 17 each year, not on a sleigh from the North Pole, but on a ship from Spain. No one would be more surprised at the role Santa plays in modern society than Saint Nicholas himself, who was actually a bishop in the ancient town of Myra, Turkey (then Asia Minor) around 300 AD. Today Saint Nicholas is remembered less for his role in destroying pagan temples than for his acts of kindness toward children. Like secretly giving poor families of young girls money for a dowry, so they could marry rather than become prostitutes. 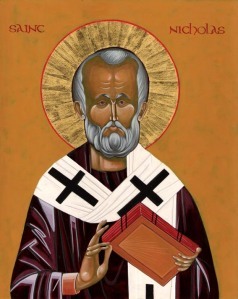 Legends of Saint Nicholas’s devotion to the poor spread throughout the centuries. As his posthumous fame grew, children would leave their boots outside on St. Nicholas Eve in the hopes that St. Nick would fill them with goodies. In Protestant Germany, Martin Luther replaced the Catholic gift-giving Saint Nicholas with the Christkindl, or “Christ Child.” Over time Christkindl’s name morphed to Krist Kindel. You may know him however as Kris Kringle. 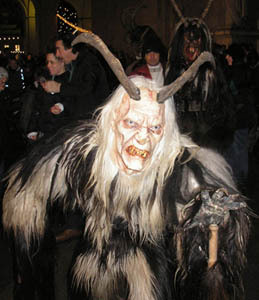 In North America Santa Claus travels by reindeer-guided sleigh, while in Europe the gift-giver is accompanied by figures such as Zwarte Piet (Black Piet) or Krampus (The Claw), the latter being a goat-headed demonish entity who whips bad children with a switch. The Bad Cop to Santa’s Good Cop. Whether you call him Santa, Kris Kindl, or Father Christmas, you better watch out, you better not cry, you better not pout, I’m telling you why: Christmas is still 20 days out and believe me, you don’t want to end up on Krampus’s naughty list! 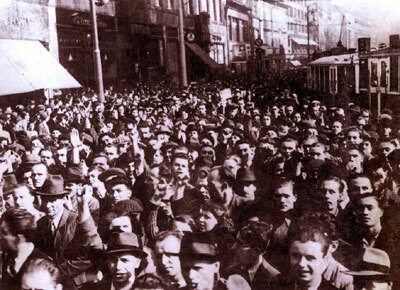 It’s a busy week in the Czech Republic, where inhabitants celebrate not one, but two public holidays in honor of not two, but three prominent theologians. 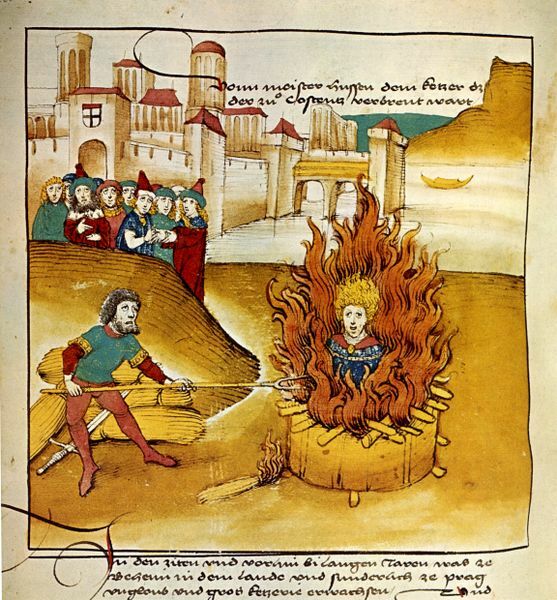 Yesterday Czechs and Slovaks alike honored the Saints Cyril and Methodius, and today Czechs recall national hero Jan Hus, the forerunner of Protestant Reformation who was burnt at the stake on this day in 1415. The late 14th century was not the best of times for the Papacy. Having just returned from 70 years in France, later called the “Babylonian captivity” of the Papacy, French cardinals were eager to elect another French Pope. Riotous Roman crowds had another idea. Under duress the cardinals elected a Neapolitan to the Papacy in 1378, then hightailed it back to France to elect the “real” French Pope. Of course both Popes retained the title, and governments around Europe were forced to declare allegiance to one or the other. 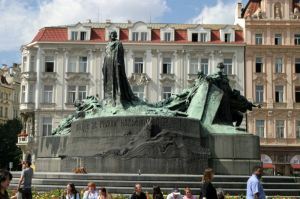 Jan Hus grew up in Bohemia during this tumultuous epoch. He studied at the recently-established University of Prague, becoming a professor of theology in 1398, a priest at Bethlehem Chapel two years later, and eventually rector of the University. Hus was an outspoken proponent of church reform. At this time the Church owned nearly half the land in Bohemia, yet taxed the poor rampantly. Hus spoke out against abuses in the church, including the widespread indulgence system which undermined the sanctity of Christian piety. He supported the preaching and reading of the Bible in common languages, and he opposed the recent doctrine of Papal infallibilit. Most controversially, Hus made the ‘heretical’ claim that the final authority of Christian Law lay not with pope, but with the Bible. In 1409, in an attempt to end the papal Schism, bishops at the Council of Pisa elected a third Pope (Alexander “the Antipope” V) to replace the other two. However, rather than resolve the Schism, this only resulted in three concurrent Popes. 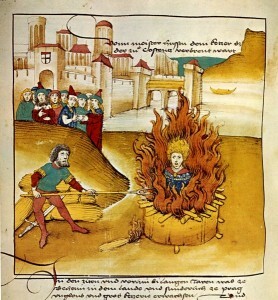 Jan Hus and his supporter King Wenceslaus declared allegiance to the third Pope, but when Alexander V’s successor issued a new wave of indulgences to raise money for a war against the King of Naples, Hus proclaimed that no pope or bishop had the right to take up the sword in the name of the Church. In rallying his followers against the indulgences, he also lost the support of King Wenceslaus who was sharing in the profits. In 1414 Hus was asked to journey to Council of Constance (which sought to end the Schism once and for all), to which he was assured safe conduct by the Emperor of Luxembourg. When he arrived he found himself put on trial by the Council and imprisoned in Gottlieben Castle in chains. The bishops had convinced the Emperor that promises of safe conduct did not apply to heretics. God is my witness that I have never taught that of which I have been accused by false witnesses. In the truth of the Gospel which I have written, taught, and preached I will die to-day with gladness. Hus was also said to have uttered a prediction that in 100 years a man would come whose calls for reform could not be ignored, foreshadowing Martin Luther and the Protestant Revolution.